Anatomy of a Murder (1959) is an unsettling story, full of troubled characters with an ambiguous ending. At first encounter it’s a courtroom drama with an outstanding jazz score, a day-lit film noir. Yet it features plot strands that are brutal, messy and ultimately dissatisfying, perhaps because it is based on a real-life murder trial from 1952. The screenplay is adapted from a lightly fictionalised book of the case by John D. Voelker, the defence lawyer in the original case. Director Otto Preminger chose to shoot the film in Ishpeming, Michigan, where the original crime took place, using its locations (including the county courthouse) and its locals as extras, including many of the jurors from the original trial. The score, by Duke Ellington and Billy Strayhorn, is somewhat different from the familiar jazz-inflected scores we hear by Elmer Bernstein, Henry Mancini, Michel Legrand and others from the era. 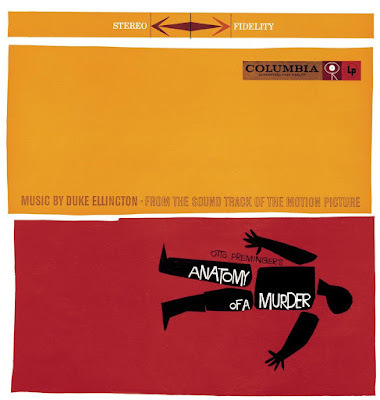 Performed by Ellington’s orchestra, which in 1959 included Jimmy Woode (bass), Clark Terry (trumpet) and a reeds section of Jimmy Hamilton, Russell Procope, Johnny Hodges, Paul Gonsalves and Harry Carney, the music works perfectly well as a soundtrack, hitting all the emotional markers the screenplay requires, and even throwing in some source music, on a car radio, and in the local juke joint, where Ellington appears as roadhouse owner and pianist ‘Pie-Eye’. But the music also works as an extra ‘character’, like Feste in Twelfth Night. At times, the somewhat anachronistic, swinging big band sound actually distances us from the action and the milieu. Like Shakespeare’s comic characters, the tunes add warmth and emotional perspective. They invite our involvement with unsympathetic characters. James Stewart plays Paul Biegler, the washed-up lawyer who defends the killer, Lt. Frederick Manion. This fits nicely into Stewart’s portfolio of compromised but somehow likeable lead characters, including Rupert Cadell in Rope, L. B. Jefferies in Rear Window, Scottie in Vertigo and It’s A Wonderful Life’s George Bailey (who, if David Thompson’s great book Suspects is to be believed, spawned Travis Bickle in Taxi Driver). As Anatomy of a Murder grinds on for two and a quarter hours, Duke’s music helps us empathise with Biegler, even when he tests our patience. Does he enable a cold-blooded killer to get off scot-free? Does Lee Remick’s character Laura (given the theme Flirtibird in the score) deserve our sympathy, or is she playing the lawyer like an old violin? Preminger’s direction slyly persuades us to sympathise with Biegler’s dirty tricks; the crucial courtroom scene requires him to denounce the dead victim in front of his bereaved daughter. He appears to be doing it for the money, or for the challenge, rather than for any deep principle. And in the final scenes, he’s cheated out of his fee. On the plus side, he’s back in the legal game, rekindling a business that has to support his sometimes drunken loyal sidekick (Arthur O’Connell) and cynical secretary (Eve Arden). Like Duke’s rhythm section, Biegler remains entirely upbeat. Whether Anatomy of a Murder is a metaphor for United States law and order – and getting away with murder – or just another ‘dark’ story, the film leaves viewers in an odd place. Critically speaking, the jury’s still out. But when Ellington and Strayhorn’s widescreen music swings into hearing, those doubts are temporarily swept away by the sheer life-affirming joy of an amazing band at the height of its postwar powers. This new CD version has all the main cues, plus some odd bits and pieces. The misleadingly labelled The Grand Finale [rehearsal sequence] is for the most part a ten-minute ‘interview’ with Duke Ellington, in which he answers unheard questions about the movie and its soundtrack. I suspect that this was produced to send to local radio stations, who could add their own questions and make it sound like an exclusive interview with the Duke – it’s a classic example of urbane, verbal Ellingtonia. Some tunes, such as Happy Anatomy, seem indecently cheerful. Sunswept Sunday is a gorgeous tone poem, dusted with celeste. One rhapsodic melody keeps returning under different titles: Low Key Lightly, which makes use of Ray Nance’s sentimental violin, the subtone Midnight Indigo, and Haupe, which features Hodges’ mellifluous alto sax. Almost Cried has a tenderness that harks back to Ellington’s classic (Blanton-Webster) band of the early 1940s. Although the main titles have a brashness that pays lip service to contemporary (late 1950s) big band sounds, Ellington and Strayhorn can’t help make music imbued with subtlety and occasional irony. And the end of Upper and Outest, featuring Cat Anderson’s implausibly high lead trumpet, seems positively avant-garde.